Pete Rock first made a splash in the 80s joining Marley Marl on his legendary radio show ''In Control'' where he quickly became known as one of New York City rising DJ's. During his time at WBLS he would slip in demos that he was working on with rapper CL Smooth which caught the ear of budding A&R Dante Ross, who along with DJ Eddie F secured their deal with Elektra. The combination of the two was just undeniable - Pete's horn driven beats mixed with CL's distinct voice and philosophical raps made a perfect match. In the summer of '91 All Souled Out officially introduced Pete Rock & CL Smooth to the hip hop listening community, and it is hard to imagine a stronger or more confident introduction. The ''Good Life'' starts things off with its perfect mix of horns and catchy bassline, while CL lays his trademark flow while speaking of the pros and cons of wealthiness. Next up is the standout ''Mecca & the Soul Brother'' which shows the duo at their best - hard pounding drums, signature horns (which will become Pete's trademark) and CL on the mic. By the time the smooth flute of ''Go with the Flow'' comes in it's clear why this is one of the most important EP releases of the 90s. Also included, the breakout hit ''The Creator'' which quickly became a club and mix show favorite featuring both Pete Rock and CL Smooth sharing mic duties. ''The Creator'' had a perfect blend of Pete's trademark production and CL ability to blend with any beat he's thrown, but also has a lighter fun tone, as if they were just sort of experimenting in the studio...to amazing results. 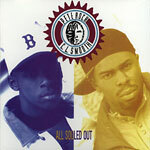 ''All Souled Out'' and a remix of ''Good Life (Group Home Mix)'' close things out making it clear Pete Rock & CL Smooth are arguably one of the best duos in hip hop, and All Souled Out proves why from start to finish. This deluxe edition of All Souled Out makes the best even better with the inclusion of five back in the day remixes and instrumentals.